I’m not sure about you, but I struggle with planning and prioritizing things. My problem is that I’m too efficient at capturing thoughts and ideas, and I’m always overwhelmed by what things I should be doing because my ‘to do’ list is way too long! 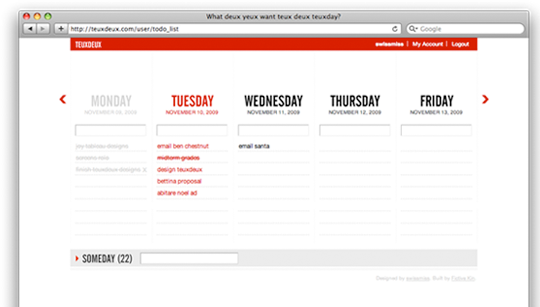 I love the layout – perfect for visualizing the tasks allocated each day for the whole week. If you don’t finish the tasks for a day, they’re automatically moved to the next day which is helpful. Once you enter a string/task, you can re-arrange the order (or move to another day) by dragging and dropping. You can also check off the task once it’s done (shows a line drawn through the task) or click an ‘x’ at the end of the line to delete it. Unfortunately, to edit a string, you need to delete it and re-add it which is kind of stupid. Helps to read the FAQ: you can edit a string by dragging to the inpput box! But it does have an iPhone app now so you can take your list with you. Give it a try and see if it can’t help you focus on getting more major accomplishments done each week! Is it just me or is the tech industry getting ridiculous? Goodbye Google Reader. Hello Bazqux!